This is a revised edition of a book originally published in 1982. It incorporates both new material which has become available during the last three decades and a substantial amount of further thinking on the part of the author. 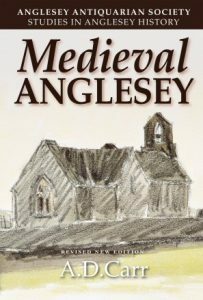 It is not a narrative history; it portrays and analyses a medieval society and community, showing what kind of place Anglesey was in the middle ages and illustrating the effect on the island and its people both of events in contemporary Wales and of developments common to most of medieval Europe. Antony Carr spent his childhood in the Falkland Islands and in Mauritius. His family then settled in Menai Bridge where he spent his adolescence, being educated at the then Beaumaris Grammar School. He graduated in History at Bangor in 1959 and after a period of postgraduate research worked as assistant archivist in the Essex Record Office. In 1964 he returned to the Department of Welsh History at Bangor; he retired as Professor of Medieval Welsh History in 2002. He is the author of four books and numerous articles on medieval Wales and is at present President of the Anglesey Antiquarian Society.